Need more information about booking Home 155632 ? Kim and Christian Vandelli are looking forward to receive your visit as guests of B&B, or to rent you the whole house during the sunny season. For fine gourmets and wine amateurs, we will give you a series of good restaurants addresses and some selected wineyards to visit. We also can organize external cook to provide extra or regular meals. It will be hour pleasure to give you guidance to select the best museums and typical local markets in the neighborhood. Golfers would love beautiful courses almost in walking distance. This Provençal style house, which has three comfortable bedrooms to offer, is set in a peaceful countryside full of olive trees and the roses and jasmine grown for the perfume producers in Grasse. The views sweep from the Mediterranean to the foothills of the Alps. The proximity of Sophia Antipolis (10mn), Cannes(20mn), Nice(30mn), and 10 golf courses within 10 km radius, means quick access to the main recreation, cultural and conference/business centres of the Côte d’Azur. Even business travellers would appreciate the proximity of Sophia Antipolis, Grasse, Antibes , Nice and even Monaco. We can organise interim cleaner during the week as separate and additional cost on the basis of 16 eur per hour. We can help you to recommend places to visit, restaurants to chose, and provide you any support to make your time worth optimum on the French Riviera. We live next to the property and are available to answer any need or question. This Villa has 4 bedrooms, 3 bathrooms and sleeps 10. It’s been listed on Holiday Lettings since 15 Mar 2011. Located in Valbonne, it has 12 reviews with an overall rating of 5. The average weekly rate varies from £2778 to £3472. The Owner has a response rate of 69% and the property’s calendar was last updated on 24 Apr 2019. We stayed at this property 3 weeks july/august and had a wonderful stay! The large terrace and pool area hold top class and you have a beautiful large very well kept garden & herb garden you are free to pick from. Christian & Kim went out of their way to make us comfortable and secure the property for our 1,5 year old and Christian would even follow us to show good places to get good wine and any issue they would help with graciously & quickly. We traveled with a 2 month old also and they made sure both children had proper beds & high chairs and the kitchen & bathroom areas were thoughtfully stocked. The villa is very close to many supermarkets (3 mins SuperU) and small boutiques for bread, meat etc and you even have a McDonald's a few minutes car drive away. We would be at the beaches of Cap d'Antibes within a 15 min. drive and Cannes & Nice alike are very close 20-30 minutes away. Valbonne is 5 minutes away and we also went to San Remo in Italy & Monaco quickly & easily from the villa and the closeness to everything is great from the villa. We highly recommend this outstanding villa to everyone. 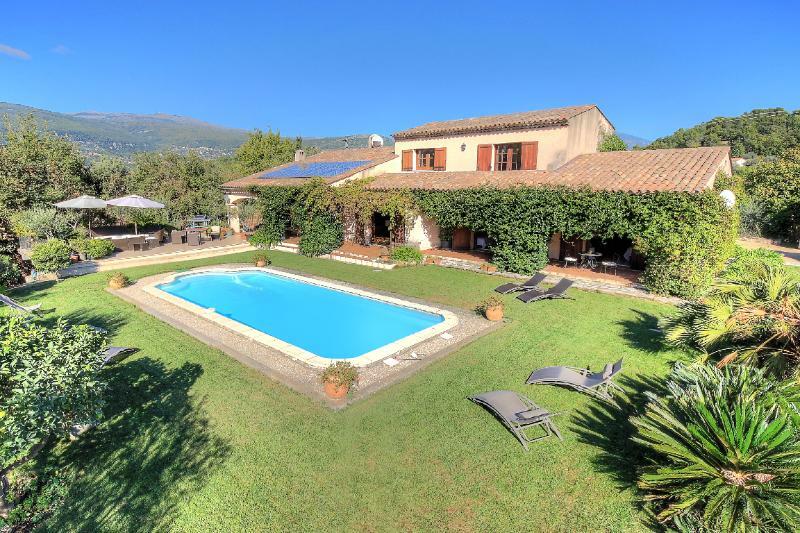 Very spacious and comfortable house in typical Provençal style with perfect view over Grasse. Big living room decorated with unique oriental art works and lovely old local furniture. Very well equipped kitchen with everything for unforgettable sunset parties with friends. Friendly, hospitable and helpful hosts. Close to shops, restaurants and interesting places. I very much enjoyed my stay at this Villa as it allowed me to stay in a very nice exclusive French neighborhood (they are on the end of a private street) as well as easily visit many villages conveniently close by. Multiple villages were just a few kilometers away and Cannes was only 8 miles away so this allowed me to enjoy multiple South of France experiences within one trip. Christian and Kim were incredibly nice and helped me out with everything I needed during my stay.